If you lived here, you could be praying by now: Where New York real estate meets financially strapped congregations. If there’s one story that sums up the changes afoot on the Lower East Side of Manhattan, a once heavily Jewish neighborhood, it’s the saga surrounding the Anshei Meseritz synagogue. 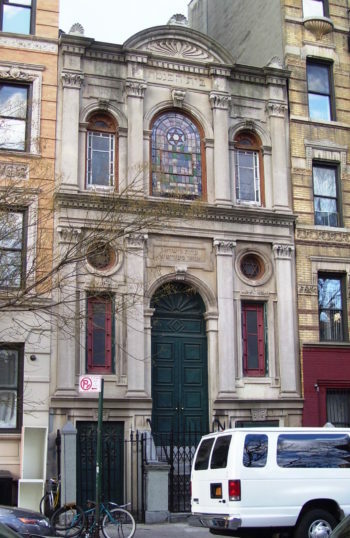 The Orthodox shul at 415 E. Sixth St. is a relic of a time when “tenement” synagogues — so named for the narrow lots they inhabited — filled the neighborhood. But in recent years, faced with a shrinking membership, the congregation had been searching for a way to stay afloat. Its salvation lay within its crumbling 100-year-old building. While the Orthodox population in and around the Lower East Side has shrunk considerably, the value of the properties they own are skyrocketing. As New York City’s property market becomes a safe-deposit box for the world’s one percent, luxury residential buildings have become commonplace across the city, including once-downtrodden areas like the Lower East Side — today the average cost of a two-bedroom condo there is $2.35 million, according to StreetEasy. In order to make ends meet, many houses of worship (churches, too) are striking deals with developers. Some have relinquished their air rights — allowing for construction atop their structures — or in some cases sold their buildings entirely to make way for demolition. These decisions are never easy — a building’s historic merit can add another layer to an already emotional and complicated transaction. At Meseritz, its saga began in 2008, when the Kushner Companies seemed prepared to demolish the structure and build a six-story building, with two floors reserved for the synagogue. The plan drew protests from preservationists and pitted synagogue members against one another. Eventually the building was saved from demolition — in 2012 it was designated part of a historic district, which meant the exterior had to remain intact. But the congregation’s financial issues remained. Enter East River Partners, a new developer with a plan that was something of a compromise: a hybrid synagogue-condo that preserves exterior details such as stained-glass windows and the original door, but is completely redone on the inside and with a new penthouse up top. When the building is completed in the next few months, the congregation, which has occupied the building since 1910, will return, taking the basement and ground-floor level. Atop the synagogue are three luxury condo apartments — two with original stained-glass windows — ranging in price from $2.95 million to $4.395 million. The developers have agreed to pay the congregation at least $20,000 annually for the next 198 years, in addition to a $600,000 payment up front and an $180,000 allowance to design and rebuild the sanctuary. The developer will keep profits from apartment sales. Though the plan drew ire from some locals, the developers say they are more than happy with the outcome. What’s more, the developers have received more recognition for the project than any they’ve done. “It’s a creative use of the property,” Kriss says. Such “creative uses”are often a win-win for the developer looking to make a buck and a synagogue struggling to pay for upkeep of increasingly expensive properties. But it’s not always smooth sailing. The Young Israel of Manhattan on the Lower East Side had its 200-year-old building razed in 2010 to make way for a synagogue-condo hybrid. Its transaction coincided with the housing market collapse and the building never happened. An empty lot has stood in the spot for years, and the congregation has relocated to a nearby synagogue. One problem, says developer Michael Bolla, is that synagogue board members are rarely well-versed in real estate deals this complicated. The Lower East Side can be a particularly tricky place, says Bolla, who was part of a group that converted the old Jewish Daily Forward building into condos several years ago. Like Kriss, Bolla sees potential profit in keeping these buildings and their historical — and often beautiful — features somewhat intact. He estimates that about 20 percent of the people who moved into the old Forward building — actress Tatum O’Neal and an heir to the Versace fortune, among them — did so because of its historic significance. The last condo to sell there, in 2015, was a two-bedroom that sold for $2.5 million, according to StreetEasy. “When you can link a project to a historical moment in time, especially if it’s a thing of great beauty, that can translate into a large profit,” he adds. Lest you think the synagogue-to-condo conversion is only occurring on the Lower East Side, take a look at Lincoln Square Synagogue, a beacon of modern Orthodoxy on the Upper West Side. In 2013, the congregation moved 100 yards south to new digs after selling its original building, a 1970 travertine structure in need of repair, to a developer. 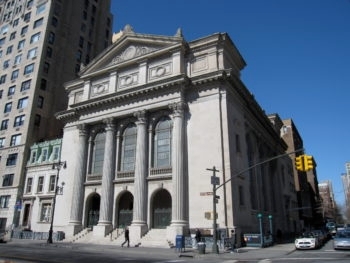 According to The New York Times, the synagogue struck a deal with American Continental Properties, a developer, for a land swap — 180 Amsterdam Ave. for 200 Amsterdam — and about $20 million to help finance the project. The synagogue’s original building still stands and already has switched hands. SJP Properties and Mitsui Fudosan America, Inc. now plan to build a 51-story luxury condominium tower with 112 residences on the site. Shaare Zedek, a traditional egalitarian synagogue on W. 93rd Street, is about to embark on its own construction project, which will see its 1923 building demolished to make way for a 14-story construction. The bottom three floors will be for the synagogue and the top floors for condos. The new community space will include a banquet room, classrooms and study spaces, as well as a new entrance to the synagogue, making the entire facility wheelchair accessible. “In today’s changing landscape, synagogues, churches and most all houses of worship are searching for new funding opportunities to support their operation and their mission,” says the synagogue’s executive director, Barbara Reiss. Additionally, Shearith Israel has a large collection of historic archives that need to be preserved, as well as four historic cemeteries in New York that need to be maintained. “Our commitments go above and beyond the pressures all synagogues increasingly feel,” Reiss says. Jody Kriss is a graduate of the Wharton School of Business with 16-years experience of developing New York City real estate. His work has produced some of the best residential spaces in Manhattan and Brooklyn.